Any purpose, anytime, the all new Mileage Calculator for Vehicles is the perfect tool for anyone that’s constantly on the go for work. Whether you’re traveling the world as an investigative journalist or you just need to catch a business meeting in another state, this simple template gives you a way to document those pesky expenses and provide your employer with comprehensive documentation at the same time. Simply enter the cost per mile and the distance your drive and you’ll have everything you need to get your Mileage Calculator up and running. After downloading the Mileage Calculator you can start entering your specific information inside the indicated areas. Your company probably has their own rules for how much they pay out per mile. Check in with whoever may have that information and write the decimal number in the “Cost per Mile” cell at the top of the page. Before you go anywhere, make sure to document the starting mileage number on your car as a point of reference for the rest of your trip. Now, as you go from day to day, enter the date in the first column of the main table below and your odometer reading at the start of each new day. In the next column of this table, you will enter the gallons you’ve purchased for gas and the cost. Remember to skip the section of the table highlighted in blue as these will be calculated for you. 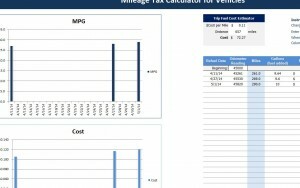 The template will automatically take the information you entered in the above steps and give you a breakdown of the miles you traveled, MPG, and the cost per mile you have attained. When you are finished entering this information, scroll back to the top of the page to receive a comprehensive review of the distance you traveled and the total amount you are owed. There is also a helpful graph that illustrates this information as well. Never be caught unprepared after your business trip again by downloading the free Mileage calculator today.